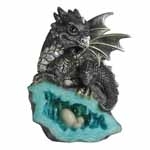 Our wide range of enchanted and mythical dragon ornaments are very popular. Our range is always changing with different items available all the time. The products are of high quality. Always a great gift for birthdays and Christmas. They are also collectable figurines from a variety of different companies such as Nemesis, Joe Davies and Fiesta Studios.